As all the changes are properly merged into the island1.scene.bin, this addin will work with level addins installed. It even supports Daft's Island 1 Enlarger and Mygod's Island 1 Infinite. How's that for nifty? Of course, any addins that add geometry to island1 (Like my "Intelligent Islands" mod) won't work with this addin installed. But it's a small price to pay! All 5 islands are on a turntable, grab and pull right or left on the arrows to see other islands. I've tested it a good amount, and haven't found anything majorly wrong, so if you find any bugs, please let me know! Special thanks to Daft as Brush for coming up with the concept and starting the project, and thanks to AP for finding the "anchor" attribute for buttons, which made it all possible. I want to see future chapter addins have dynamic level buttons like this! - As the signposts in Chapter 4: The Information Superhighway are hardcoded, signposts in these levels will be the normal, rather than ISH, signs. - There are some glitches with the OCD flags for Tower of Goo and Chain (If you OCD Tower of Goo, then Chain, when the particles for unlocking Ode to the Bridge Builder appear, the OCD flags are reversed). I can't figure out exactly why this is, or if it's a bug in the original game. If anyone knows how to fix it, let me know! - Very minor aesthetic glitch if Island 1 Enlarger is lower in the addin queue than this addin. Insignificant, so I'm ignoring it. - The hardcoded "new level" arrow appears overtop the level text, so I changed the alpha of that image so you can still see through it and read the level name. I figured this was a good compromise, rather than shrinking the arrow and messing up the aesthetics of added chapter addins. Let me know if you disagree and think this should be taken out/changed. -Changed text in MapWorldView to read "World of Goo" instead of "The Goo Filled Hills." This will be very useful to modders. I may work with it. Wait... Does this make it so that you can make 4 chapters elsewhere without replacing the original level ones? If so great! But then you can't replace the 1st chapter and make it so you can have an entirely new 5 chapter game... If there was an addin that connected one game to another via a level button on the main menu screen that would be bomb! Then I could make my game continued off the original game from their menus! Oh, well... this would make it easier for beginner chapter modders! @Gooballs: I think this was intended for use with all chapter addins so you would still have access to the original levels. EDIT: I just tried it out. This is magnificent. The unfixed camera is a little annoying, but I can live with it. And do you think there's a way to change the music track when you spin to the next island? Also, maybe you could change the island image in the MapWorldView to show a little bit of each island, just so you realize it's not Chapter 1. Note: people might want to have my "ISH Signs" addin enabled while playing Chapter 4 levels. You can just disable it when not playing them. But anyway, awesome mod! This is extremely handy for extra chapters, especially if you still want access to the original levels (for reference or whatever). People will just have to make sure that they don't override Chapter 1. Also, I'll look into anchoring buttons, sounds interesting. 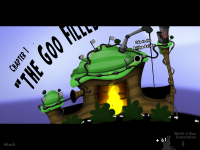 This gives me an idea for making the sequel for The Goo Worlds. I was looking forward for this to give my chapter a good-looking spin attribute so people can spin the map to look over levels. Nice work MOM! That is correct; the idea is to have nobody ever override Chapter 1, since GooTool is pretty finnicky about adding other addins into it, and with this addin installed, other addins can be as well. (merging changes to Chapter 1 is a HUGE pain, especially if you've made it into a completely different chapter) It's a win-win situation for everybody, to be honest. If chapter makers don't override Chapter 1, then players can still play all the original levels (some people like to have the beginning level of their addin depend on completing Observatory Observation Station- how will the users be able to finish Observatory Observation Station if they haven't already if the chapter-maker overrode Chapter 5? ), and even better, can still install as many levels as they want. This makes them more likely to leave the chapter installed for longer, and if they get stuck, rather than uninstalling the addin so they can install others, they can always play original levels and other addins and come back to the chapter later. Chapters 2-5 can be safely overridden without any harm done. The unfixed camera is a little annoying, but I can live with it. And do you think there's a way to change the music track when you spin to the next island? I thought about it some... I couldn't think of a straightforward way to do that. There is a possibility of hinging particle effects to each chapter, though, so you can have snow in Chapter 3, leaves in Chapter 2, that sort of thing. One thing that would be fairly easy to do is change the backgrounds as the world spins- I'll work on that a little later. If anybody can think of a way to change music, that'd be swell-- at present, live with it. Also, maybe you could change the island image in the MapWorldView to show a little bit of each island, just so you realize it's not Chapter 1. I think the metal levels should be updated because it doesn't support this addin. You don't have to update old addins to work with this one if you don't want to, but it'd be nice just so we have some standardization. I meant how touching the border of the level caused the camera to move. The whole chapter is already visible, so this seems tedious. Ah, yes that. It's kinda due to how GooTool, the chapter-enlarging addins, and such treat island1. It has to be a set size in order for everything to work, and Daft's Island 1 Enlarger changes the camera zoom too, so there's really not much that can be done. I don't use the enlarger, but that makes sense. For me, I used to be able to play chapter 1 with this and the intelligent island mod. Yep. Hence why I don't recommend having both installed at once. Beautiful! Just beautiful! I'm totally going to use this in Another Planet, I have an idea for shrinking five chapters into four. Quick question...did you ever add the changing music to this? If not, I have a way it would work--you could make a Util ball with the music as its "collidesame" event sound and Stacking, then make a little track for it such that it collides with another of itself at the loop point of the song. If the geometry rotated the forcefields would no longer line up with the track, as they can't rotate, and the next track would come into place and start working. Very good plug-in, I like! !